This one leads to the basic premise of the book. The core message which is extremely simple but not easy. Understanding that we can actually only do one thing at a time. The question then becomes, what is the most important thing to do? What is the ONE Thing that if done would make everything else easier or unnecessary? This question should be applied to all areas of our lives. After we choose our ONE Thing, how can we structure our lives in order to reach its completion? The authors actually suggest that we should go small. What they mean is that we should ignore all the things we could do (those shiny objects) and just focus on the most important tasks that are gonna bring most of our results. That means doing a serious 80/20 analysis of your life, choosing the most important things and focusing on them ruthlessly, discarding the rest. The One Thing philosophy is actually quite inspiring. Gary and Jay state that you can actually shoot for the moon with your goals if only you prioritize and put all of your energy into your one thing. Most people dilute their efforts by trying to accomplish everything at once. That is a trap that must be avoided. We must understand that success is sequential. It happens over time and happens one step at a time. Much like a domino, if one step is omitted the whole sequence fails. That’s why must strive for completion and that is best done by focusing on one milestone at a time until it is achieved. Some examples are then given of successful companies that all have one thing in common. They all seem to focus on one product or service. That’s what Pareto’s Law dictates after all. The majority of the results or the positive outcomes seems to stem from a small minority of causes, be it one person, one skill or one passion. The authors propose to take this to the extreme. Apply the principle to the 20% of the 20% and keep doing that until you get to the one most important thing. The 6 Lies of Success. Not everything matters equally. We are trapped into thinking that everything is urgent and important when in reality there are only a few things that bring the results we want. Those are the ones we should be focusing the majority of our time on. Efficiency is different than effectiveness. Being busy and checking off unimportant tasks won’t bring us any closer to the end result we desire. That’s why it’s super important to have a clear sense of priority. And in order to protect your priorities, you must learn to say no. We can do more things at once but we can’t do is focus on two things simultaneously. Much like what Tim Ferriss suggests in The Four-Hour Work Week, we must deploy single-tasking. Whatever we are choosing to do at whatever time, must be our only focus in order to get the most value out of it. Our problem is not that we don’t have enough time. It’s simply that we don’t have priorities and try to juggle too many things at once. No one can juggle many things at once. The only way to “bypass” this is to learn how to task switch effectively. However, even that may not always be as optimal as single-tasking and focus on the one thing. Not to mention the risk of loose ends. When switching tasks all the time, the probability of you coming back to your original task and actually completing it falls rapidly. Another reason not to multitask is the time it takes for you to refocus from one task to another. It may seem insignificant but there is research that indicates otherwise. Add the highest probability of mistakes and the stress that comes from trying to multitask and I believe you get that single-tasking is the clear winner here. Contrary to popular belief we don’t want to rely on discipline because it diminishes quickly and easily. What we want to do is focus on a few things and make them habits in our lives, ideally one thing at a time. After all, doing the one thing makes worrying about all the unimportant stuff redundant. WIllpower is the ability to delay gratification to focus on what’s important to be done. It’s a huge indicator of success. The problem is it can easily be depleted. That’s why we should prioritize on doing our most important actions and the ones that require the most willpower when we do have the most of it and that’s typically in the morning. In the second parts of our days, we should choose to put ourselves in situations where willpower is not imperative to what we want to achieve. The idea here is that absolute balance is a myth. When someone strives to achieve extraordinary results, they can’t do it in the middle. Sometimes half-assed won’t work and you need to go to the extremes. Wisdom is knowing when to pursue the extreme and when to pursue the middle. The work hard play hard mentality best summarizes this takeaway. The actionable way to go about this is simple. Imagine your life having two buckets. Work and Life. For the Work bucket decide what’s important and go to the extreme for that. Let everything else slip away. For the Life bucket though you can’t ignore the multiple areas that comprise it. You can’t ignore your health or the people you love. Those are things we can never get back. So, the solution is to identify the most important things to do for each of those areas and focus on them to get the biggest return on investment. There is a tendency in our society to reward reasonable thinking. However, thinking big is what will actually lead you towards what you desire. Thinking Big will open your eyes to ways and possibilities you would have never thought about. Furthermore, thinking big will stretch you to become better and realize your true potential. Not only that, you may even be surprised as to how bigger your potential is compared to what you thought about it. The quality of our answers comes from the quality of our questions. Therefore, we should ask ourselves: What is the ONE thing that if done will make everything else easier or unnecessary? Don’t stop for the first answer. Try to look for an answer that stretches you and motivates you beyond what you currently believe is possible for you. Here the importance of having a clear purpose is stressed. What the authors suggest is having a clear purpose, your one thing and working every day bit by bit towards its completion. This strive towards the fulfillment of your purpose actually seems to be the path towards happiness. Having a clear purpose seems to have a positive ripple effect on your productivity and ultimately your life experience. But how do you find this purpose? Ask yourself what excites you. What keeps you moving even when you’re tired and what makes you wake up excited every morning. That is your big why and your passion. In order to fulfill your purpose, you must have priorities leading to it. A reward that is far away in the future won’t motivate you. So, work backward and chunk your purpose down. Decide on your 5-year one thing, the 1-year one thing, the 1-month, 1-week and lastly 1-day one thing leading to your 5-year one and ultimately your purpose. In order to be productive and make sure you are working toward your purpose, you should time block 3 types of activities. First, your time off. Time block your vacations and your free/personal time every day. Renewal is valuable and you should treat it like important business. Then, time block your ONE thing. Jay suggests to time block at least 4 hours each day for own one thing. Lastly, time block time to time block :P. Simply schedule time to plan. i) View mastery as a journey and not a destination. Following Malcolm Gladwell’s Outliers, they introduce the 10000-hour rule. Supposedly, it takes 10000 hours to achieve mastery in a certain field. So, broken down, you must invest 3 hours per day, every day for 10 years to achieve true mastery of your purpose. ii) Moreover, always look to expand your natural capabilities with everything you do. iii) Learn to hold yourself 100% accountable. I first learned about this important mindset shift from Jack Canfield’s Success Principles. Don’t play the victim and never make excuses. Hold yourself 100% responsible for everything that happens or not happens in your life. Seek solutions and never whine about the situation you are in. i) Inability to say no. Realise that when you say yes to something, at the same time you are saying no to something else. Remember that you can’t please everyone. Filter out all your decisions related to your one thing. Learn to appreciate its beauty and anticipate it. Exercise first thing in the morning to start your days on a high note and with high energy. Beware of people who don’t support you and may be blocking you from success. Enjoy the Journey and realize that the final destination is not the most important. Live a life worth living and strive to have no regrets! I’ve had quite a bit of a difficulty to focus on one thing at a time myself. I have been changing workout programs every month. I was searching for different internet marketing products to follow. I have been struggling to balance my electrical and computer engineering studies with my internet marketing career. What I have found that I have the most clarity when I focus on one thing at a time. I decided to invest in the Wealthy Affiliate platform for making money online and I have never looked back. I am committed to my one girlfriend and I’m happy with it. Sometimes in life, it will be difficult to focus on just one thing. But, ultimately that should be our purpose. The rewards are big and at the end of the day, there is no other way around it. 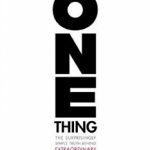 Question of the Day: What is your ONE Thing? Have you struggled to find your one true purpose and prioritize? Have you found ways to deal with that? Share in the comments below. Before you Leave: If you found the summary useful do me a favor and like it, as well as share it socially with whoever might enjoy it. Thanks, everyone! Hello Antonis, wow, this is a fascinating book. And I can see how it helps to jump start our priorities and true needs. I also read Jack Canfield’s book and it turned my world around. Ultimately what I really appreciate about this review and the book, is that it comes down to living in the present. And when we make that choice, we can do anything. Jack Canfield is awesome. The ONE Thing is truly phenomenal to set your priorities straight that’s for sure. Your point about living in the presence is golden. You can’t really focus fully on two things at each one time. Hope you find the ability to focus on your ONE Thing, Ariel. Cheers! Everything sounds good in theory. The implementation is up to you. Be sure to use the audible trial that gives you two free audiobooks on Amazon.